Sweet and hot mexican candy with a bubble gum. 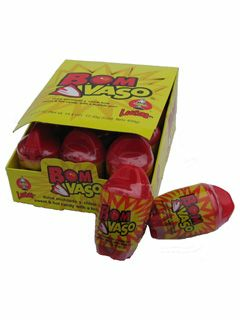 Lucas BomVaso (Bombaso or Bom Vaso) is a sweet and hot mexican candy with a taste of tamarind and bubble gum. Bom Vaso is manufactured in Mexico by Lucas World owned by Effem Mexico Inc. Effem Mexico is a division of Mars Inc.
MARS INC. based in McLean, VA was founded in 1911 and is the maker of M & M's, Snickers and Milky Way. Mars is among the largest privately held companies in the world, with global annual sales of more than $15 billion. In late 2001, it bought Mexican candy maker, Grupo Matre, folding it into its Mexican unit, Effem Mexico. Based in Santa Catarina, Mexico Effem makes Lucas candy, a popular Mexican candy line. We welcome you to browse our Mexican candy section for other products. Dulce enchilado y chicle de bola. Lucas BomVaso es un dulce Mexicano con sabor a tamarindo y chicle. BomVaso es un producto de Lucas World fabricado por Effem Mexico Inc.